»Today it's the 15th of October – the day of the white stick – a beautiful, autumnal morning. 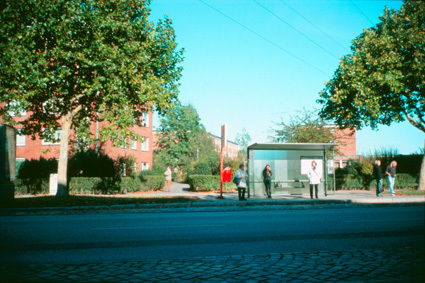 I am standing opposite to a bus stop, the stop of the bus line number 161 and number 163, both towards Horner Rennbahn. The bus stop has been built from unbreakable material and offers space for adverts. This bus stop is a busy one and many people live close by who mainly use the stop to travel towards the Horner Rennbahn, where one can change into a subway towards the centre of town. There is a waste basket to the left of the bus stop, which doesn't get properly used, often rubbish is just been thrown on the ground. There are seats inside the bus stop, which face the busy Manshardtstrasse. There is a lawn behind the bus stop and a hedge with so called ›four dots houses‹. A group of people is standing at the bus stop, I estimate four to six.